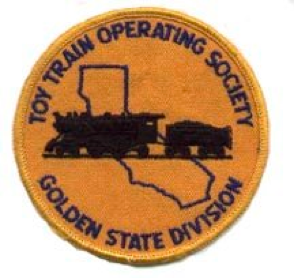 The Golden State Division of the Toy Train Operating Society is based in San Jose, CA. The Golden State division is one of the 20 local divisions nationwide that make up the Toy Train Operating Society, an international hobby organization with about 5,000 members worldwide. The Golden State division has about 100 members. We welcome guests and encourage them to join our national organization and our local club. Our member meetings are held on the 2nd Friday evening of every month (location TBD). From 7 to 7:30PM we buy, sell and trade toy trains and visit with friends. At about 7:30PM there is a short business meeting, followed by the evening's program. The meeting usually ends around 9PM. The programs cover many subjects, such as repairing or painting toy trains, favorite trains, scratch built trains and/or buildings, train history and many other topics. Cupertino Square (Vallco Fashion Mall) in Cupertino, CA was where our public display layouts were located. Unfortunately due to the ownership change at Vallco we have been forced out of the space we called home for the last few years. We are currently in the process of finding a new location. Our club has a Yahoo! mailing list - this will be the best place to find when and where any upcoming meetings take place. Important announcements will also be posted here and on our Facebook page.